If you keep many archived files on your computer, whether to save space or reduce clutter, you know that accessing the compressed content is not easy, as you normally have to unpack the archives beforehand. 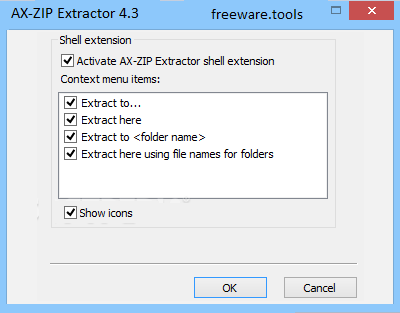 AX-ZIP Extractor is the utility for extraction of files from ZIP archives and other widely used archive formats. The utility is integrated into Windows Shell. Original, double tree program interface allows to manipulate simultaneously several archives and to minimize the number of operations while working with archives. Work with items of archives is similar to work with files and folders in Windows Explorer. Besides, AX-ZIP Extractor is simple and convenient file manager. AX-ZIP Extractor is a nifty application that enables you to explore the contents of your archives as if they were regular folders, and it can help you extract files with a single mouse click. AX-ZIP Extractor provides you with two browser modules that can be used to manage archives and other files. They are almost identical, the only difference being that one is designed to help you explore the contents of archives and the other functions as a general-purpose file browser. Data is represented in the form of a tree-like structure, and you can view the contents or compressed files by simply clicking the “+” sign displayed to the left of their name. In addition, you can extract archives by dragging them from one panel to the other, and it is possible to synchronize the two browsers at any time. The application allows you to search for archives, as well as files contained in these archives, with the help of wildcard characters. However, you cannot set advanced filters. To avoid having to find the same file more than once, you can add it to your bookmarks and access it from the Archive Browser of File Browser toolbar at any time. You have the option of integrating the application with the Windows context menu, making it possible to unpack archives directly from the File Explorer. The new functions can be condensed into a single menu, and you can disable the ones you have no need for. Overall, AX-ZIP Extractor is an intuitive application that allows you to browse the contents of your archives and unpack them with one or two mouse clicks. It supports a wide range of archive formats and features a user-friendly, minimalistic interface.